- Publisher You adore your spouse . . . but why is communication so difficult? 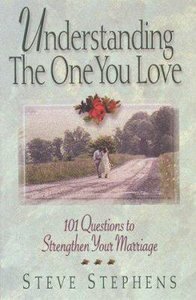 This insightful book offers 101 fun questions for couples to answer together---"If we built a house together, what style would you like?" By opening the doors to communication you'll learn to share your hearts as you grow together in love! - Publisher Through hundreds of questions, inspiring reflections on love, and spiritual insights on relationships, Stephens helps couples draw closer together by stimulating conversations on priorities, the future, personal preferences and experiences, commitment, finances, and children. About "Understanding the One You Love"
You adore your spouse . . . but why is communication so difficult? This insightful book offers 101 fun questions for couples to answer together---"If we built a house together, what style would you like?" By opening the doors to communication you'll learn to share your hearts as you grow together in love! Through hundreds of questions, inspiring reflections on love, and spiritual insights on relationships, Stephens helps couples draw closer together by stimulating conversations on priorities, the future, personal preferences and experiences, commitment, finances, and children. Dr. Steve Stephens is a licensed psychologist, marriage and family therapist, and popular seminar speaker. A clinical member of the American Psychology Association and the American Association of Marriage and Family Therapists, he has counseled couples and individuals for more than twenty-five years. Dr. Stephens is the author of more than twenty books, with over one million copies sold. He is the coauthor of "The Walk Out Woman" and "The Worn Out Woman with Alice Gray," He and his wife, Tami, live in Oregon with their three children.